The Best Florence Events Calendar for What's On! What are the best things to do in Florence in April 2018? Of course it all depends on what you're 'into' but rest assured the choice is vast and varied indeed! Spring is upon us and the sun has started peeking out from behind the clouds...this is also one of the best times of the year to visit Firenze. 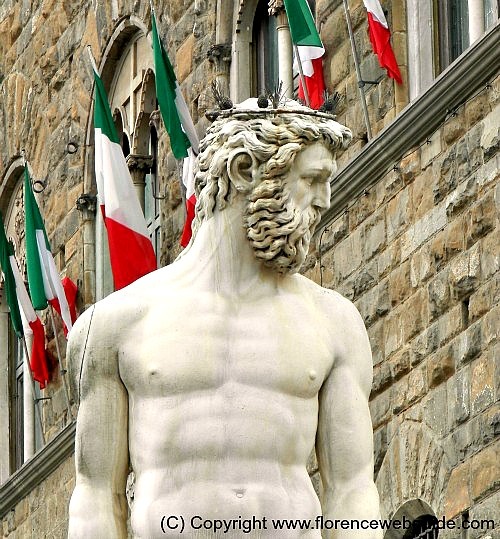 And here's an Insider Tip to start you off about things to do in Florence in April: the 25th of the month is 'Liberation Day' in Italy, a national holiday. The country commemorates the day that the nation was liberated from Nazi Germany. Know that on this day most all business activities and many museums will be closed. Moreover, people usually take advantage of this day off to make it a long weekend and take trips around Italy...and Florence is one of the favorite places to come to! So, book your hotel early as it may be hard to find accommodation on the days around this week and the weekends before and after this holiday in April. April 25 is Liberation Day and the city celebrates with a marching band procession and an open-air concert. 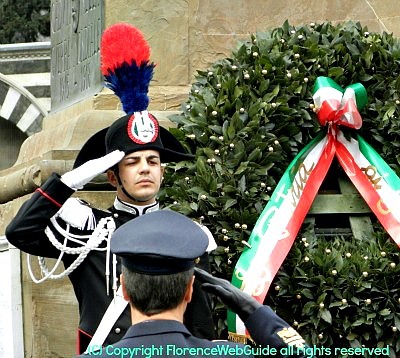 The carabinieri marching band, war veterans and city officials pay their respects to fallen war heros at a wreath laying ceremony in the morning (see pic right). See marchers dressed in period costumes representing the Florentine Republic in honor of those who fought for liberation. 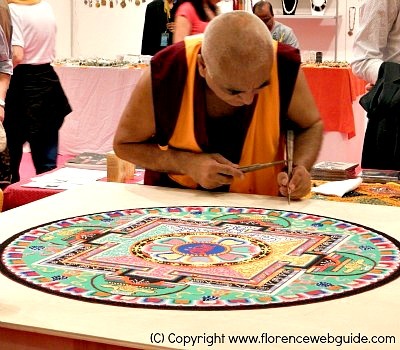 This is a great occasion to take part in one of the traditional things to do in Florence in April! This is a special event for visitors to Florence. Later in the afternoon the Rossini Orchestra conducted by Giampaolo Lazzeri will be performing a selection of pieces in an open air concert for all. Get there early - crowds expected. The most popular things to do in Florence in April 2018 are (and probably always will be!) the 'classic' ways tourists visiting the Cradle of the Renaissance love spending their time. You know, visiting the world famous museums, taking Florence sightseeing tours, enjoying Tuscan cuisine at the town's best authentic restaurants, and - last but not least - shopping! 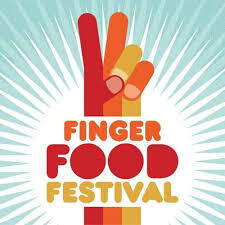 A festival celebrating all types of foods that are easy and fun to eat with your hands: the Florence Finger Food Festival! But don't worry, although there will indeed be plenty of finger food, you'll also be able to find pasta dishes. The city's biggest and most popular park is host to an event that showcases the best of quality food brought to our tables (mouths!) from itinerant vans and trucks. Enjoy exquisite authentic Italian (and foreign) cuisine while strolling around the lush green lawns of what used to be the hunting grounds of the Medici family and is now is a lovely park and horse-racing venue. This is one of the really fun free things to do in Florence in April 2018 and is a fantastic day out for kids and families. ART - Arts & Crafts at their Very Best! The Florence events calendar for April brings you one of Europe's most important Arts & Crafts fairs, the 'Mostra dell'Artigianato', aka 'ART'. Looking for something besides museums? Since 1931 craftworkers have been bringing their talents to the city to show their stuff at this annual trade show. Insider Tip! Go on weekdays to avoid the very large crowds on weekends. A visit to Italy is not complete without taking in a top-notch Italian opera. One of the best things to do in Florence in April is to see a live performance in one of the city's historic churches! Mostly Italian operas like La Bohème, La Traviata, or Madame Butterfly are on the program, as these are the most popular and loved masterpieces that never go out of fashion. Florence's antique churches are a unique setting, allowing you to really absorb the historic atmosphere while seeing the performers up close - venues are very small so you don't miss any of the action! 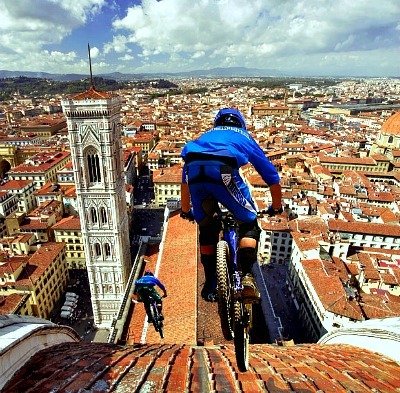 If you're into cycling one of the great things to do in Florence in April is to check out the Bike Festival of Firenze! The festival is even more deeply felt as Tuscany has recently been the host of the World Cycling Championships. And if you're not into cycling? This is a great choice anyway for things to do in town that are outdoors since the festival is held in the city's largest and most popular park, just enjoy the setting! The Florence ice cream festival gives us three whole days to celebrate the food everybody loves! This delicious event is held in one of the city's most important tourist destinations - Piazzale Michelangelo - the famous square everyone goes to to see the breathtaking views of the city. Here quality is a guarantee because all the ice cream stands compete for the first prize for the best gelato! 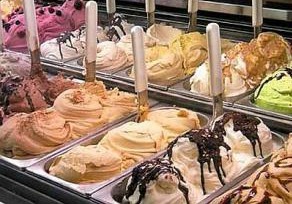 According to some accounts, ice cream was actually invented in Florence in 1559 by Bernardo Buontalenti. Still today this name marks a popular flavor of Italian ice cream, 'Buontalenti' (a sort of rich vanilla). So what could be more apt than an ice cream festival in Firenze for one of the most fun things to do in Florence in April? At the festival you can see ice cream in the making, taste the competing flavors all vying to win the 'flavor of the year' award, and get your 'gelato festival' card which lets you take part in all the events, initiatives and workshops. Needless to say this is a great event for kids in Florence!! I Giochi di Carnasciale come to Florence's Cascine park! See what life in the Middle Ages was like at a medieval village authentically re-created in the middle of the city's largest park, one of the truly special things to do in Florence in April. 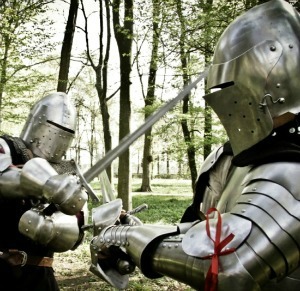 Medieval life is played out in all its aspects, complete with musicians, flag throwers, knights, merchants, shopkeepers, craftsmen and soccer players, all in period costumes. Festivities, events, competitions and concerts start at 10 am and go on til late in the evening: sword fights, jousting tournaments, flag throwing demonstrations, and medieval soccer games are just a few examples of events on the schedule. Want something off the beaten path? What better way to enjoy the pleasures of Spring than a yearly flower exhibit? 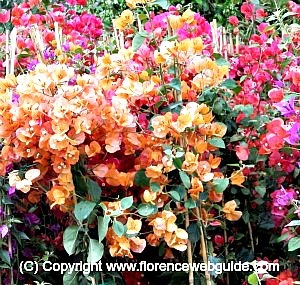 Florence is host to the 'Spring Plant and Flower Show' (Mostra Primaverile di Piante e Fiori) which takes place every year from April 25 - May 1. Indoor and outdoor plants and flowers are on display with exhibitors coming from all Italy. The exhibit is held in one of the city's lovely gardens - il Giardino dell'Orticoltura - home to a recently restored antique 'tepidarium' in white cast iron, Italy's largest greenhouse. Great for the kids as the garden also has a small playground. 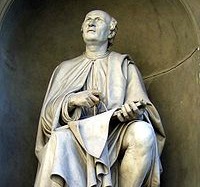 Filippo Brunelleschi was the mind behind the Cupola, the dome over the cathedral. The church, Santa Maria del Fiore, had been dome-less for over 100 years before Brunelleschi managed to figure out how to construct and keep standing such a large cupola. Brunelleschi died on 16 April 1446. The city remembers the great architect on the anniversary of his death with a wreath laying ceremony and procession of representatives of the Florentine Republic in traditional renaissance dress. One of the things to do in Florence in April is to join in on the procession that starts off from Palagio di Parte Guelfa and carries on to the Basilica. Brunelleschi is buried in the crypt of Santa Reparata in the Duomo and 2 wreaths will be lain at his resting place. Classical music lovers here's a special Insider Tip and one of the most interesting things to do in Florence in April for free! The 'Careggi In Musica' group have been cheering up the Careggi hospital for over 15 years with their free Sunday morning concerts open to all, first come first seated. April 29 - Giulia Panchieri on the viola (Giulia was awarded best viola player of 2017) and Matteo Bogazzi on piano. 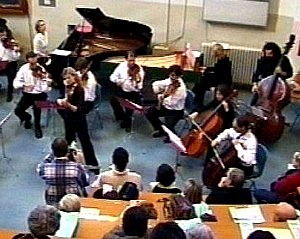 Shostakovich, Piazzolla and Debussy. Get bus no 14C, get off at Brambilla stop. Give yourself extra time to get there early and find the auditorium! A fantastic occasion on the Florence events calendar for April 2018 - free of charge! 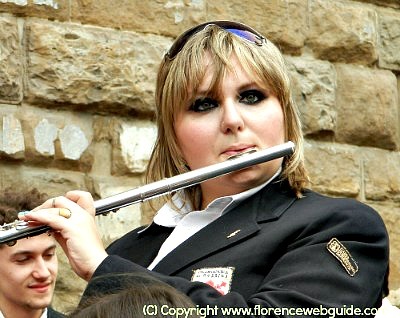 This is one of my favorite things to do in Florence in April, or any month for that matter! 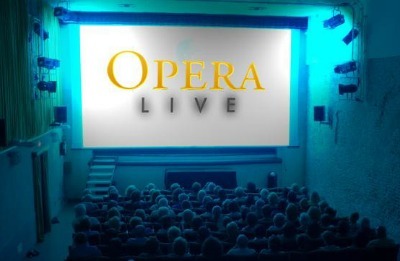 Watching on the big screen at local cinemas that bring the live performance to Florence from Paris, London or New York! Soccer - See A Live Match! Whether you call it 'soccer' like the Americans, 'calcio' like the Italians, or 'football' like the British, we're talking about the most popular sport in the universe! AND, the national sport of Italia! NOTHING is more authentic or 'real' than going to the Sunday match to root for the local team, AC Fiorentina. The atmosphere of the stadium, the passion and dedication of the fans, the flag and banner waving, the volcanic uproar when the team scores....this is one of the best things to do in Florence in April if you want a genuine Florentine adventure! Looking for sporty things to do in Florence in April 2018? Well, runners unite! 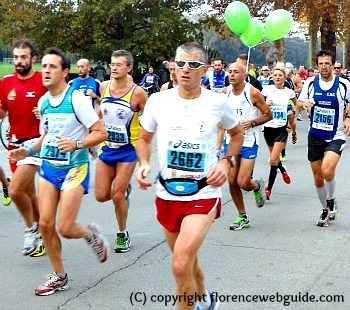 Sunday April 15 is the day of the half marathon of Firenze! The race will start at 9:30 in Lungarno della Zecca (near National Library). Anyone can join in on this event...there's a competitive race for 'real' runners, a non-competitive run, a walking 'run' and also a kids' race! Discover the world of tango dancing at the Florence Tango Festival! Firenze becomes home to live Argentinian music, tango performances, dance marathons, DJ sessions, tango lessons, and dance exhibitions. The festival will be holding several workshops for aspiring or seasoned tango dancers as well! where: the Teatro Affratellamento in via Giampaolo Orsini, 73 and the 'Circolo Grassina' in a small town just outside Florence.